This is a recipe I never thought to share here on Fresh Bites Daily until the boys said that it must be featured in one of their videos. Indeed, it is a staple food for them on some of those busier weeks when they are starved and I am otherwise engaged. Frederick has gotten old enough that he can make these for himself and Alastair. I laughed at the video below and my super secret tip for making these the best ever personal pizzas, especially that I’ve perfected these over the version from my childhood. I have indeed — with the wisdom of my mother. She served them to me on English muffins warmed under a broiler in one step — muffin plus sauce plus toppings, broiled. We make them in two steps in a toaster oven. 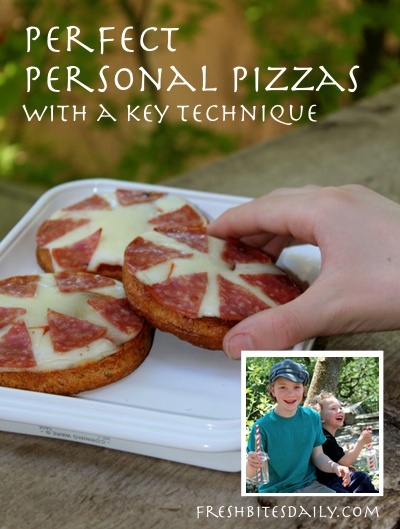 The toaster oven makes it easier for the kids to do themselves and, yes, the first step (the added step) is the key to the best ever personal pizzas on the entire planet. I am going to let you watch the video for the big reveal. As for ingredients, use your favorite bread. In the video, the boys are using a sourdough bread but English muffins are excellent too. Use what you have and what you love. You can’t miss. Use a prepared pasta sauce for your sauce. We are lucky enough to have it canned from the tomatoes in our garden, so that’s a “can’t miss” situation. Whatever is in your pantry will work well too. Mozzarella cheese is the cheese of choice since this is pizza but we have used Jack cheese in a pinch and it’s quite good too. Load it with the toppings of your choice.